Assistant Professor Jorge Rodrigues and a student study soil microbes. Shrinking glaciers, higher sea levels, and increased flooding. More intense heat waves, droughts, and tropical storms. Widespread loss of species. A broad story of the effects of climate change is being written every year, and it’s less Walden and more Paradise Lost—and an alarming vision of our future. Scientists predict that global temperatures will rise between 2.5 and 10 degrees Fahrenheit over the next 100 years. But this change in climate will affect different environments in different ways, with most of the details about how various organisms will respond still unclear. A trio of UT Arlington biologists hopes to fill that gap by investigating the impact of environmental shifts on very different species. For Jorge Rodrigues, it’s microbes in the Amazon, while Laura Mydlarz is tackling reef-building corals in the Caribbean and Laura Gough songbirds in the Arctic. Through their work, the researchers hope to uncover how small environmental changes taking place now may end up having far-reaching effects in the future. Last year was a bad one for the Amazon rainforest. While deforestation in the region had been declining steadily for a decade—the Brazilian government calculated that 4,571 square kilometers of the forest under its purview were cut down in 2012, compared to 27,772 in 2004—a change in the country’s law saw the rate jump back up by 28 percent. Most people acknowledge that such losses severely threaten the region’s rich ecosystem, as the Amazon basin contains one-fifth of the Earth’s freshwater and is home to at least one-tenth of its species. (More than 1,200 new plants and animals were discovered between 1999 and 2009 alone.) But what’s less known is the havoc these environmental changes can wreak on a vibrant but nearly invisible community: microorganisms. Biology Assistant Professor Jorge Rodrigues is studying the response of one subset of that group—soil microbes like bacteria, fungi, and algae. Since 2009, he has worked in Rondônia, Brazil, with collaborators from the University of Oregon, the University of Massachusetts, the University of São Paulo, and Michigan State University on research funded by the U.S. Department of Agriculture, the Department of Energy-Joint Genome Institute, and Brazilian research foundations. Located in western Brazil, the state of Rondônia once boasted more than 51 million acres of rainforest but has seen heavy land-clearing since the 1970s. As roads were built, migrants arriving to the Amazon would typically cut down the trees and use the land for crops and cattle. But if the land proved unsuitable for long-term use, they would abandon the sites, usually in less than a decade. This enabled secondary forest to sprout up in the cleared areas. 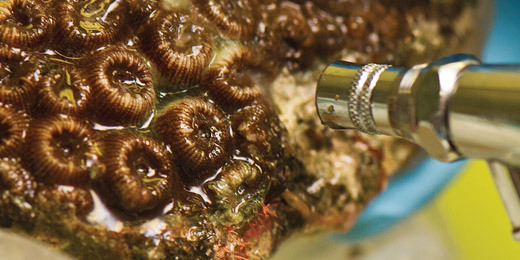 A research assistant processes coral samples. To understand the differences in the soil makeup between the three resulting environments—primary forest, grassy pasture, and secondary forest—Rodrigues and his colleagues gathered samples from each over a 100-square-kilometer area at Fazenda Nova Vida. “Believe it or not, there’s not much information about what kind of microbes you have in tropical forests, what they’re doing, and what kind of biological cycles are changing as we convert forest into pasture,” he says. Soil in general hosts an incredible diversity of microbes, with one gram alone containing an estimated 10,000 species. Using samples frozen and brought back to his UT Arlington lab, Rodrigues employed two methods to analyze the microbes. In the first, he isolated and cultivated nitrogen-fixing microbes (diazotrophs) on a petri dish, although only 0.1 percent of microbes will grow that way. In the second, he extracted DNA from the soil sample and sequenced the 16S ribosomal RNA gene to identify which microbes were present. While previous research indicated that the changes in the Amazon’s environment might be beneficial to soil microbes because more are usually found in the pasture than the forest, the work of Rodrigues and his collaborators paints a slightly different picture. Although the number of species did increase under the grass, the composition of the microbes remained the same, something that’s known as biotic homogenization. In comparison, the microbes collected from the forest were both different from those in the pasture and internally different from one sample to the next. (The secondary forest had a combination of microbes from the pasture and primary forest.) So while the pasture may have more total microbes, the forest actually contains a more diverse set of species. This discovery is troubling because microbes are essential to carbon and nitrogen cycling, which in turn affects the Amazon’s ability to function as a vital storehouse of greenhouse gases. It’s not yet clear what happens to the forest microbes when the land is converted into pasture—they just disappear from the samples—but whether they are permanently lost is unknown. To get a broader picture of the state of these microbes, one of Rodrigues’ collaborators, Brendan Bohannan from the University of Oregon, has begun collecting soil samples in the Congo rainforest in central Africa. When he brings them to UT Arlington this fall for the DNA extraction, it will allow the team to expand its view and see how—and even if—microbes from opposite sides of the world differ. Like the Amazon rainforest, coral reefs are being threatened due to changing environmental factors, namely overfishing, pollution, coastal development, and rising ocean temperatures. As a result, the past decade has seen an increase in the incidences of bleaching and infectious disease outbreaks in the underwater realm. In the Caribbean alone, more than 80 percent of coral reefs already have been lost, according to current estimates. Laura Gough and Ashley Asmus inspect insect samples to determine their biomass. “Coral reefs are among the most biologically diverse places in the world, with thousands of fish species alone calling them home,” says biology Associate Professor Laura Mydlarz. “Their decline is a serious threat not only to this diversity, but also to the livelihoods of communities living on the coast. Knowing more about their susceptibility to disease will help us predict future changes and challenges. The world’s oceans are home to approximately 1,500 different types of reef-building corals, with only 70 or so of those uniquely found in the Caribbean—a number that is slowly declining. For example, Elkhorn coral, once the Caribbean’s most dominant shallow-water species, has been decimated over the last three decades due to disease and factors such as hurricanes, bleaching, and temperature change. Though it’s clear that the reefs in the Caribbean—which are smaller and closer to shore than those in Australia and Indonesia—are particularly susceptible to environmental changes, the whys and hows of the problem are not yet fully understood. Specifically, researchers like Mydlarz are asking how corals fight disease and why some species have had greater success fending off pathogens than others. 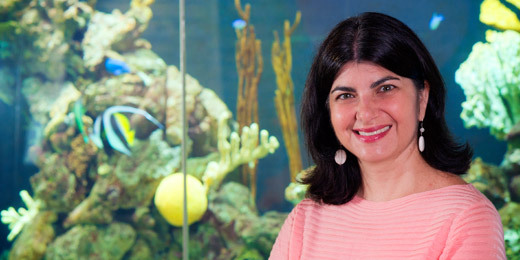 Mydlarz’s recent work—funded by a four-year grant from the National Science Foundation (NSF) and conducted with collaborators from the University of Puerto Rico at Mayaguez and the University of North Carolina at Chapel Hill—focuses on gorgonian coral (aka sea fans) and stony corals in the waters around Puerto Rico. Specifically, she’s examining their defense mechanisms to elucidate how and why the former have managed to survive, and even thrive, while the latter have succumbed to disease, temperature stress, and bleaching. “We’re trying to figure out the reason some corals are faring better and then relate that information back to the ones that are doing poorly to see if there is any kind of mechanism in the immunity that will predict which ones will respond better,” she explains. Though the Caribbean and Arctic are distinctly different places, the effects of climate change are proving just as foreboding in both. After collecting samples from the reef and running experiments in the field, Mydlarz and her students freeze the corals in liquid nitrogen and ship them back to her lab for further testing. At UT Arlington, they separate the tissue from the coral with an airbrush and use the DNA, RNA, and proteins to test the corals’ immunity in several ways. These include looking at the functioning of melanin synthesis—which helps to wall off pathogens—and testing antibacterial activity against both marine and non-marine bacteria, including those known to cause diseases seen on the reef. Using next-generation technology to sequence all of the expressed genes in a coral, they also examine the RNA to see which are involved in coral immunity. Thus far, the research has demonstrated that individual corals do react to disease differently. The ones that are better prepared to fight off the pathogens before they are able to infect the tissue are the ones that dominate reefs and take over when the more sensitive corals die. In addition to examining the corals, Mydlarz and her students study the pathogens, taking bacteria and fungi from the diseased corals and growing them in the lab under different temperatures to see how they respond. What they’ve found is that the bacteria and fungi grow more quickly and virulently as temperatures increase. When combined with the additional environmental stresses the corals now face that suppress their immune systems, the dynamic of the relationship changes. Making it all worse is the fact that corals, unlike humans, only have innate immunity, so they don’t have the ability to develop resistance to infections. That means they can keep getting hit with the same disease over and over again. Warmer temperatures in the Arctic have resulted in the expansion of greenery across the landscape. Biology Professor Laura Gough has spent the last four years investigating how, exactly, the increase in shrubbery affects higher-level organisms—in this case, arthropods and two species of migratory songbirds. Funded by an NSF grant, Dr. Gough and her collaborators from Columbia University and the University of California–Davis are studying the summer arrival and breeding patterns of Lapland longspurs and white-crowned sparrows from the Toolik Field Station in Alaska’s North Slope. (Lapland longspurs nest in open tundra, while the sparrows prefer the shrubs.) The team also is measuring the concentration of bugs in the area—an important source of protein for the baby birds. “One reason we study the birds is because they eat so many insects,” Gough says. “They are such important insectivores in keeping insect populations down.” For example, in the tundra, the birds consume Alaska’s famously large mosquitos, which have been known to kill caribou calves by distracting them so much that they stop eating. “In their wintering grounds—the white-crowned sparrows, for instance, come down into California—they’re also consuming bugs that carry diseases, which has a direct human implication,” she continues. Although Gough is a plant ecologist, her UT Arlington lab processes all the bug samples from the project. Doctoral student Ashley Asmus returned to Alaska for her third year this past June and spent the summer months collecting bugs. She used nets to sweep the air and installed plastic cups filled with ethanol into the dirt for the ground-crawlers to fall into. In the summer of 2013, she also used a reverse-engine leaf blower that sucked up all the creatures in the area. She and the other researchers had to work fast, though, as each year they only have a short window of field time. The birds arrive from the south in mid-May and depart at the end of July, while the snow melts sometime in early June and returns by the end of August. Because the summer season is so short and the field station so remote, the researchers must work six days a week, 12-14 hours a day. “One of the big jokes is that you can stop working when the sun sets—at the end of July,” Gough says. But the long days pay off—Asmus collected more than 1,000 samples of bugs last year, including beetles, mosquitos, bumblebees, grasshoppers, spiders, and other arthropods, and should have even more this time. Back in the lab, Gough, Asmus, and “an army of undergraduates” are now analyzing the samples. 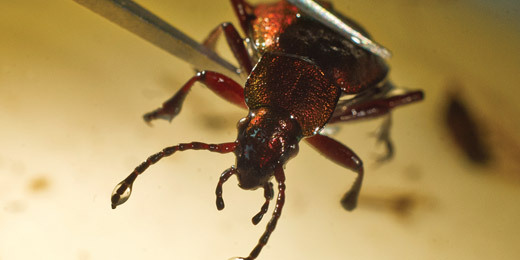 Instead of weighing each bug individually, they count up the number of bugs in the vial by type and then, using a pre-determined formula specific to the species, calculate their weight based on length to determine the collective biomass, with each sample representative of a square meter of soil. They’ve found that the biomass of bugs is lower in the shrubs than in the open tundra, although that difference is related to which arthropods live in which habitats. However, as the amount of shrubbery increases due to warmer temperatures, this could have serious implications for the birds. 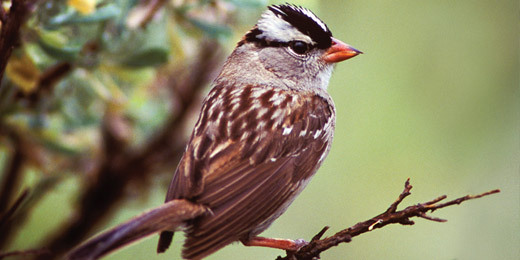 To adapt, the white-crowned sparrow, which nests in the shrubs, is expected to significantly expand its range northward—and already has over the last 20 years. At this point, it’s not clear if the birds are moving north with their habitat or because the snow is melting earlier, enabling them to migrate farther. But what is clear is that the Lapland longspur will likely be negatively impacted as its tundra nesting grounds continue to shrink. 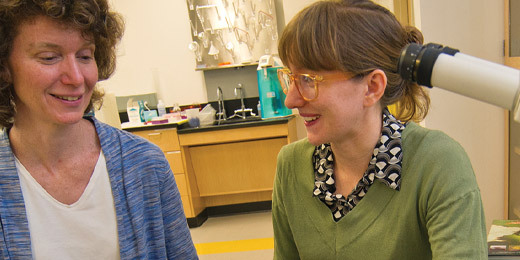 Although the team’s NSF grant ended in August, Gough hopes to continue studying the interaction between the plants and higher-level organisms. This time, though, she plans to change the focus from songbirds to small mammals, specifically the voles and lemmings that call Alaska home. Indeed, the work of these three UT Arlington professors is vital to our understanding of how current and predicted climate changes have begun to impact individual ecosystems and the life-forms that rely on them for survival. Only through the research of Gough, Rodrigues, Mydlarz, and others like them will we be able to get a clearer image of what our planet may look like for the rest of this century—and the future beyond.